"The Not-So-Curious Case of Low Political Participation in Romania." Calitatea Vieții, a peer-reviewed journal published by the Research Istitute for Quality of Life, includes in its most recent issue the paper of our colleague Claudiu Tufiș. The paper displays a series of aggregate level statistics, depicting the participatory and pre-participatory political culture in Romania. Claudiu Tufiș discusses about tolerance, joining social movements and civic associations, interest in politics, voting. This creates a list of potential manifestations of the participatory culture in the public space, and its prerequisites. 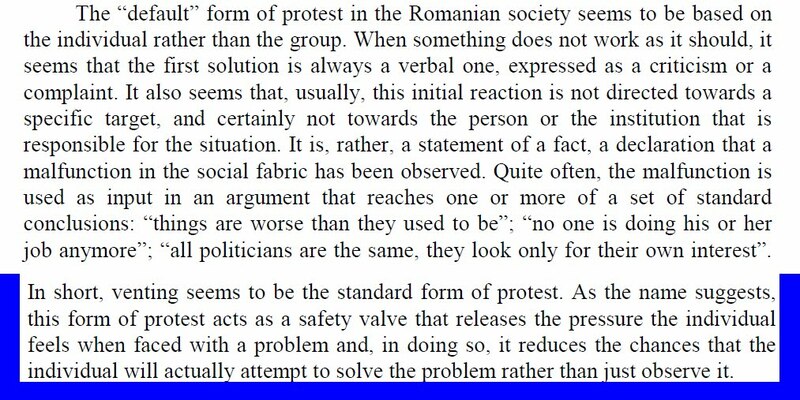 The goal is to provide the reader with a comprehensive picture of how non-participative the Romanians are. Several explanations are suggested, including the historical deficit (in line with the path-dependency hypothesis), the rather individualistic act of participating, the tendency to react to “malfunctions in the social fabric” rather by criticism than by searching for solutions. Data from the Romanian Electoral Authority, as well as from the European Values Study and the World Values Survey are employed. The focus is on Romania, and the perspective is not comparative, but dynamic. The resulting text is rich in information, being an excellent source for those who need a short but intensive outlook of the Romanian political realities (within population, not at the level of the elite). Our colleague does not test explanations, but prefers to formulate potential hypotheses, to be tested in subsequent publications. The full paper can be downloaded from the journal’s website.